The only party I'll go to even if there aren't any snacks. The only thing better than a Mario Party is a Super Mario Party. Right? Let’s start things off by establishing the obvious. I love the Mario Party series. Any gaming event centered at my place will usually involve at least one foray into the Mushroom Kingdom to see who the true Super Star is (and unfortunately, that person is not always me). Since playing the original Mario Party back in the ’90s on the same Nintendo 64 that still adorns my shelf, I’ve eagerly awaited each new entry in the series with a bib to absorb any drool that may unintentionally dribble out of my excited maw at the mere mention of a new game. 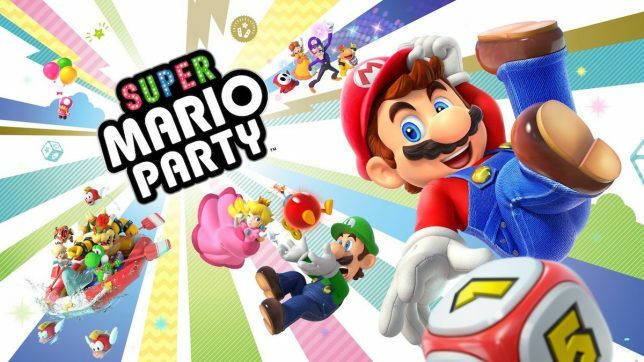 The year is now 2018, the Mario Party is now Super, and the bib is now saturated. I ran to Target (although experts would have you believe I drove) as quickly as I could to grab this beautiful gem and returned home posthaste to pop it into my newfangled game machine, the Nintendo Switch. Immediately my eyes lit up upon seeing that title screen as it sparkled and scintillated against my eyeglasses. Nothing could rival this moment (except maybe a new F-Zero game). I wanted to come into this review with one thing stated fairly clearly. I’m interested to see whether this new addition to the series is not only an enjoyable experience on its own, but whether it can undo the damage my heart heavily felt at the release of Mario Party 9 and the betraying sting of disappointment I weathered upon my first experience with Mario Party 10. I suppose you could say that I’m of the large majority of series fans who were incredibly upset that Nintendo decided to alter the familiar Mario Party formula that had coddled us for so long. When I first viewed the Nintendo Direct that featured Super Mario Party‘s initial announcement, I was overcome with sheer ecstasy from what I saw. A return to form? Bringing Mario Party back to its roots (forgive me for using that mundane phrase)? My wishes had been granted. Well, at the very least, my wishes concerning this one minuscule aspect of my childhood had been granted. And dammit, that’s enough to make my whole month! Story: Right away we start off with a story I can absolutely get behind. It’s a simple Mario Party story! No rough edges, nothing complicated, no extraneous characters. Just good, old-fashioned simplicity: Who is the Super Star? We don’t know! Let’s have a Mario Party to find out! It’s incredibly kind of Mario to humor his friends like this, considering…well, you know. Toad and Toadette agree to be impartial judges in the festivities. Everyone is up for the challenge. This is it. I was ready to smile my way through the rest of the intro cutscene already, completely jovial and satisfied that things had finally taken a turn down Simpler Times Lane, but then the game surprised me with something that, to my knowledge, hasn’t actually been attempted before in any other Mario Party title: Bowser and his baddies crash the discussion and say they want in on the action! It might seem like something minor or cutesy, but I was floored when I realized what was happening. Sure, we got Spike in Mario Party 10, but nobody played that game, so it doesn’t count. This is something real and tangible. Bowser and the Koopa Troop are here! I mean, the dude just shows up and starts casting serious aspersions on Mario and his buds. Sure, Bowser. And maybe we’ll be getting a new F-Zero game sometime this millennium. Bowser brings along a judge of his own, Kamek, who agrees to be, uh, “impartial” as well. Using what I can only assume is some of the most apropos magic ever studied, Kamek whips up a Party Plaza and the fun kicks right off! Well, at least, when you finally pick your jaw up off the ground and start pressing buttons. This Mario Party entry boasts the most playable characters of any game in the series, with even more yet to be unlocked at your first outing. Presentation: I don’t have much else to say concerning the state of this game’s visuals except that they are stunning. I would expect no less from a first-party title in the Mario franchise anyway, but either way, it’s still radical to see that Nintendo poured some of the prettiest assets into this game, because it shows in volumes. If I could mention one course specifically, Megafruit Paradise is straight-up eye candy, and I devoured every last bit. Gameplay: Arguably the most important part of any game is, well, being able to play it, right? But it always comes down to much more than that, in theory. Enough of my babble, let’s lay down some seriousness. I’d argue that, even from a loving place, the original Mario Party trio on the Nintendo 64 haven’t aged terribly well as far as gameplay. The first one, for example, had those dreadful minigames that saw you spinning that hard, plastic, uncompromising control stick until your thumb (or, let’s be honest, the palm of your hand) was emblazoned with a stinging red mark. Certain minigames in Mario Party 3, despite its being my favorite in the series, are admittedly difficult to grasp and can be hellish to control. As the series progressed, I felt that gameplay became more intuitive and responsive, which is blatantly a step in the right direction; every new entry in a series should do something akin to improvement. 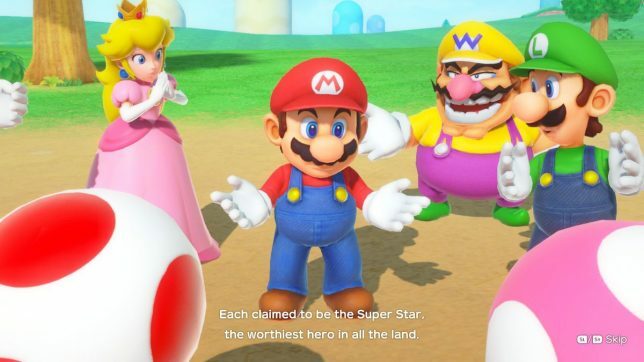 This is where Super Mario Party really shines. The control scheme has been simplified, much like the story, and players use a single Joy-Con. For most of the game, you’ll be holding it horizontally, like an NES controller, but in certain cases, the game will ask you to change it to a vertical position. In either case, the number of buttons at your command is relatively small, compared to the Nintendo 64 or GameCube controllers. Additionally, all of the motion-controlled actions and button presses required of you as a player are clearly explained in a way that is not imposing. Any action you perform, any minigame you play, and any menu you sift through are all easily controlled and managed. Of all the minigames I played during my first few games, not a single one confused me or felt difficult to understand and control. Single-player and multiplayer were both perfectly enjoyable. In playing the game with my sister to engage in some classic couch co-op, we laughed, swore, and roasted each other just as much as with any other traditional Mario Party title. My only gripe about the multiplayer is that there is no traditional board game mode when playing online with a friend, and that is seriously, seriously a big deal. Nobody wants to play Mario Party just for the minigames! We want action! We want drama! We want to hurl four-letter words into the void because someone stole my freaking Star again, why does this keep happening to me!? Did anybody buy Mario Party: The Top 100? Either way, I can only hope in my heart of hearts that the game is patched to include online support for a traditional board-centered experience, but I’m not terribly optimistic about it. Immersion: I will say that the game is not incredibly immersive, since it’s not a traditional story-driven experience. I didn’t plunge into Super Mario Party with any expectations of the sort, because that would be like expecting Nintendo to release a new F-Zero game (am I getting the point across?). However, I have a singular complaint regarding the game’s immersion anyway, because I feel as though it subtracts from the game regardless of what kind of experience it is. The text-crawling and explanations are slow. Board events are slow. Taking turns is slow. Waiting for the Dice Block to roll is slow. Super Mario Party is slow. Now, don’t get me wrong. The sluggish speed of the game notwithstanding, I still enjoyed myself, but at times, even during my first playthrough, I found myself reaching for my phone to check social media because an opponent’s turn was just dragging on and on, and they were doing some pretty simple things. This might just be a personal gripe because I’m used to more fast-paced gameplay from this series, since I think a newcomer may find the speed to be perfectly cozy. But for my tastes, I have to give that a thumbs-down. Whenever a game, the thing that is supposed to be curing your boredom, is making you reach for something else to cure your boredom, it is not doing a good job of being immersive. 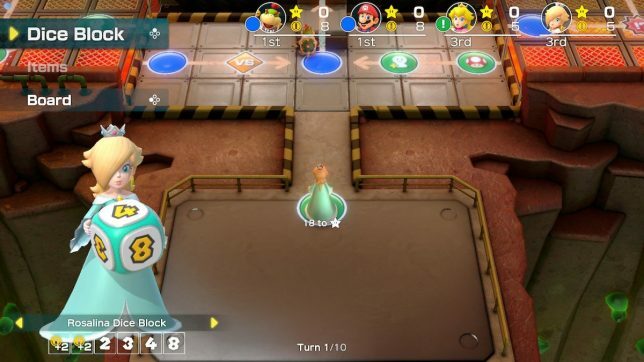 Mechanics: Any seasoned Mario Party veteran will be familiar with the mechanics of a Mario Party game. But let me be the first to say that those same veterans may be disappointed when they learn the fate of their beloved board mechanics. Toad refers to Nintendo’s decision to deviate from familiarity. Firstly, Stars no longer cost 20 coins, but instead have been depreciated to 10. Starting out, this isn’t much of an issue, because each player now also begins the game with five coins instead of the usual 10. However, while playing, I found that minigames awarded many more coins to the winner(s) here than in other Mario Party titles, which made Stars no challenge to purchase. 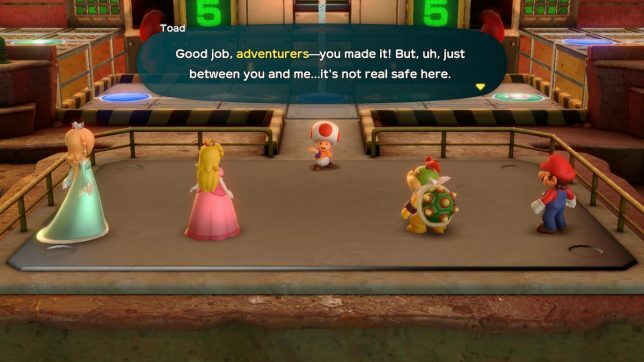 This, coupled with the reduction in size of each board to less than half of what I would expect from any other Mario Party, made the game almost childishly simple. Granted, there are board events that can change the price of the Star, but in other titles, your issue most of the time would just be finding your way there, adding a sufficient edge to the challenge. Here, it’s practically always a beeline for the Star, save for your occasional deviation to get some coins or visit the shop. One new addition to this title is the inclusion of character-specific Dice Blocks, which I rather enjoyed. In older Mario Party titles, a standard Dice Block afforded you the probability to roll as high as a 10, but the Dice Block here has also been shrunken down to size and only rolls as high as a six. This isn’t terrible, however, since those character-specific Dice Blocks balance this out perfectly. Oh, Rosalina. Some day I’ll have a daughter named after you. 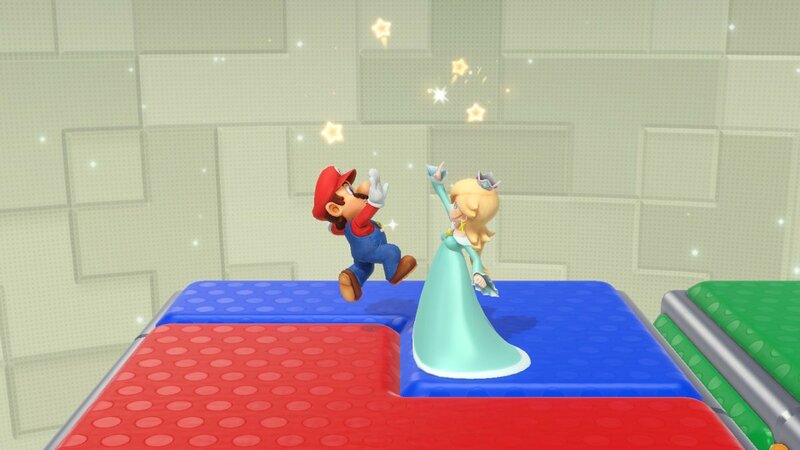 Rosalina is my preferred character for any Mario-related outing, and so she was my first choice here as well. Her Dice Block allows her the opportunity to roll differently than the standard one to six; specifically, Rosalina has two chances to gain two coins (but move no spaces), and she can also roll a two, three, four, or eight. How radical! This adds a ton of replay value to the game, since players will want to come back and use different characters to experience each Dice Block for themselves. The game even does a good job of allowing you to experiment with multiple character-specific Dice Blocks in one go by introducing an ally system. There are certain spaces on the board that, if landed on, will give you an ally chosen at random from the roster of characters who were not selected for play in your game. Once that ally is on your team, their character-specific Dice Block becomes available for you to use permanently, and they also add a roll of either one or two to every single roll you make from then on. It completely balances out the fact that the standard Dice Block is a shadow of its former self, and it’s a welcome addition. Charm: This game is seriously delightful with some of its more minute aspects. I won’t mention a ton, because you ought to experience the game for yourself, but I will discuss a few things that stood out to me. Firstly, when passing opponents while moving around the board, you shove them out of the way as you pass, and they stumble and produce an annoyed or surprised grunt. I just thought that was cute. Secondly, I highly appreciate the fact that you can pause at just about any moment in the game. Even if you’re transitioning between the board and the minigame screen, you can pause right then and there and go take that much-needed bathroom break, no questions asked. However, my favorite little thing about this game is the fact that it prompts you to high-five your teammates after you win a team minigame. By swinging the Joy-Con to the side in a traditional “All right! We won!” manner, you initiate a group high-five, which made me smile and giggle every single time. It also adds two coins to your prize for winning the minigame, so it rocks the stripes right out of my socks and you should always do it. This image is my new desktop background and it should be yours, too. Music: The least I have to say about this game in any regard is about its music. While it wasn’t bad music by any means, it certainly didn’t feel memorable or worthy of being hummed (unlike my favorites, “Faster than All” and “The Wide, Wide Ocean” from Mario Party). In all honestly, I found myself humming more of the tiny jingles for board events than any of the actual pieces of music in the game. But maybe that’s not necessarily a bad thing for a game where the thing you’ll probably hear the most of is your friends’ exasperated shouts of how much they abominate you. I realize I went on a tirade about this game, but I’m pleasantly surprised and seriously impressed with how it turned out. Sure, I’ve got a few complaints, but it’s nothing that lowers my enjoyment level of this game to a notch even remotely close to dissatisfaction. In fact, I’ve been playing practically nonstop since I bought it. Super Mario Party does a few things wrong, sure. But what it does right is leaps and bounds more important and vastly overshadows any mistakes or undesired aspects of the experience. Pop this sucker into your Switch and get ready to curse at your friends. They probably deserve it, those cheating hacks. Wow! A timely and relevant GameCola review! We should do this more often. I haven’t had a chance to play the game yet, but I definitely agree that the general pace of the game is kinda slow. There’s a lot of care put into the various animations of the game but the trade off is that all those extra frames of animation build up over the course of a turn to really slow the pace down. I can also understand the balance issue regarding the 10 coins for a star, though my heart still wishes for the 20. 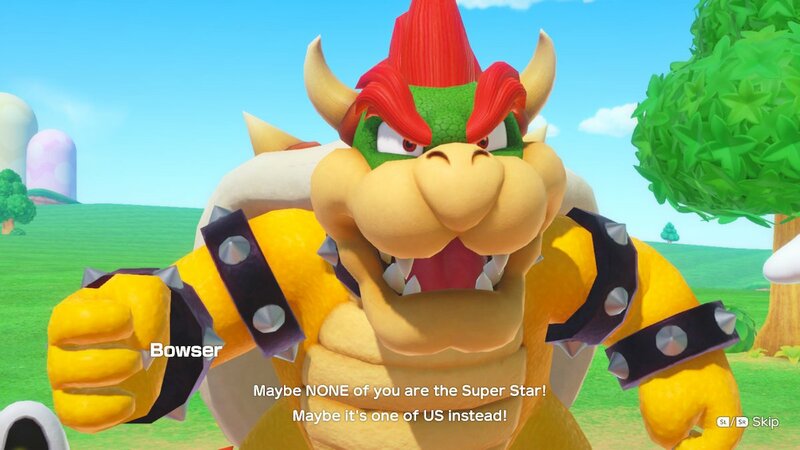 So often in Mario Party games no one has a chance to get any stars, and SMP seems to be focused around shorter games a la the Switch’s general guidelines, so it makes sense that it’d take less to get stars. Or maybe I’m happy to have anything other than the dreaded together-car. I’ve seen a couple playthroughs of boards but have also not had a chance to play! I think it seems good so far, as compared to the last couple. It definitely goes back to that classic feel as opposed to the CAR. Anna talks about life sims that make real life less awful.